The following is a prayer to Ss. Peter and Febronia of Murom recently approved by the Synod of the Russian Orthodox Church for their commemoration (and for the emphasizing of the importance of Christian marriage) that was previously approved for the Sunday prior to September 19th n.s., which was previously approved in December 2012 (along with petitions for the augmented litany). This translation was graciously provided by Fr. Alexander Lebedeff, with a minor tweak from Fr. German Ciuba. O ye who have greatly pleased God as all-wondrous miracleworkers, pious Prince Peter and Princess Febronia, intercessors of Murom, protectors of honorable marriage and zealous prayerful intermediaries for all of us to the Lord! During the days of your lives you showed an example of piety, Christian love and faithfulness to one another even to the grave, and thus you glorified lawful and blessed marriage. For this we turn to you and we pray with firm zeal: lift up for us sinners, your holy prayers to the Lord our God, and beseech for us all that is good and profitable for our souls and bodies: true faith, good hope, unhypocritical love, unshakeable piety, success in good deeds*, and, especially, through your prayers grant to those who have been joined in the bond of marriage chastity, love for one another in the bond of peace, oneness of mind and body, a bed undefiled, a blameless life, long-lived seed, the blessing of children, homes filled with all good things, and, in eternal life the unfading crown of Heavenly glory. Yea, O holy wonder-workers! Disdain not our prayers, which we raise up to you with compunction, but be our eternal intercessors before the Lord and grant unto us through your intercessions to receive eternal salvation and to inherit the Heavenly Kingdom, that we may glorify the inexpressible love for mankind of the Father, and the Son, and the Holy Spirit, God, worshiped in the Holy Trinity, unto the ages of ages. Amen. especially to those who wish to be joined in the bond of marriage grant, through your prayers, chastity, faithfulness to one another and love in the bond of peace, oneness of mind and body, a blameless life and, in eternal life the unfading crown of Heavenly glory. If you have a question you would like to submit, you can e-mail me (my address is on our parish website). "How exactly do the commemoration lists work? I know I write the names of Orthodox or non-orthodox people I’m praying for, and then eat the Prosphora bread afterwords… But how do I get the commemorations read out during liturgy? I’m praying for a deceased friend of a friend… Also, for commemorations of the living, are those typically just the sick? Or do we do list those we’re praying for “in general”? For instance, my parents, God Parents, friends that I’m trying to introduce to the church, etc…"
Commemorations can be submitted during the liturgy by either writing out the names of those who are to be commemorated, on the sheets of paper that are placed near the prosphora, or by getting a commemoration book and putting their names in it. If you are using the sheets of paper, there are sheets with read ink that are for the living, and sheets with black ink that are for the dead. In commemoration books, the living are listed in the front section, and the section for the dead follows that. You simply place your commemoration list with a prosphora into the appropriate basket. Only Orthodox Christians can be commemorated by name during the services. You can include the names of the non-Orthodox in your commemoration book, but they should be labeled as such, and it is best to have them listed in a separate section. For more on how one could set up a commemoration book, see "How to Set Up a Personal Commemoration Book." It is very important that we not just submit names to be prayed for by the priest, but that when we submit those names, we first pray for them ourselves. As Archbishop Vitaly (Maximenko) of blessed memory used to say, we should not be like cuckoo birds that lay eggs in the nests of other birds, and leave the job of hatching those eggs to others. If we ask others to pray for someone, we should also be praying for them. By submitting a prosphora with a list of commemorations, you are participating in the proskomedia, and you are praying with the priest for those people that you have listed. In our parish, these commemorations should be submitted before the end of the first litany at the beginning of the liturgy. If you have a commemoration book, you can also pray for those you have listed during the week as part of your morning and/or evening prayers. In the Jordanville Prayer Book there is a section at the end of the morning prayers in which these commemorations could be done. It is a pious practice to take the prosphora from your commemorations, cut it up and let it dry out, and to eat a little bit each morning, after your morning prayers, and to take a sip of holy water. Prosphora should be eaten before you eat anything else that day. For those who cannot attend a daily liturgy, this is a way of participating in the liturgy to a lesser extent throughout the week (see also: Sanctified Bread, by Fr. Victor Potapov). 1. The Augmented Litany, at which time we can pray for people who are celebrating a special occasion, such as a names day; we can pray for those who are ill; and we can pray for those who are traveling. 2. Commemorations are also done at the Great Entrance. In our parish, aside from the fixed commemorations, we usually only pray for the departed, but some parish also do other commemorations at this point. 3. At weekday Liturgies, apart from Great Feasts, a litany can be done for the departed. There are several Soul Saturdays during the year in which we especially pray for the departed. If there is someone that you would like to have commemorated aloud during the Liturgy, it is best to let the priest know before the Liturgy begins. In a pinch, you could have a note sent into the altar, but again, only the Orthodox can be commemorated aloud by name during the services. You can also ask the priest to serve a pannikhida for any Orthodox reposed you may wish to pray for. This is especially done on or near the anniversary of their repose. For the recently departed, a pannikhida is usually done on the first, third, ninth, and fortieth day of their repose. For the non-Orthodox, I would recommend that you use the Akathist for the Repose of the Departed, which is in the Book of Akathists from Jordanville. For the living, you can request a moleben to pray for any pious purpose, which would certainly include prayers for the salvation of a relative. You can also do a reader's moleben for those purposes as well. This is the first post in a new series I will be doing: Questions and answers about the Orthodox Faith. If you have a question, you can e-mail me. Question: Often we read in the Fathers that, when we are practicing the Jesus Prayer, we should "let our mind descend into our heart." What does this mean and how do we do it? Maybe that's an easy one, but I've never understood it. Answer: I cannot speak to this question from personal experience, but I would recommend two books on the subject, and then will quote some excerpts from one of them, which in turn quotes from the other in answer to your question. 1. "On the Prayer of Jesus", by St. Ignatius (Brianchaninov). 2. "The Power of the Name", by Metropolitan Kallistos (Ware). "The repeated Invocation of the Name, by making our prayer more unified, makes it at the same time more inward, more a part of ourselves — not something that we do at particular moments, but something that we are all the time; not an occasional act but a continuing state. Such praying becomes truly prayer of the whole person... In Orthodoxy, as in other traditions, prayer is commonly distinguished under three headings, which are to be regarded as interpenetrating levels rather than successive stages: prayer of the lips (oral prayer); prayer of the nous, the mind or intellect (mental prayer); prayer of the heart (or of the intellect in the heart). The Invocation of the Name begins, like any other prayer, as an oral prayer, in which words are spoken by the tongue through a deliberate effort of will. At the same time, once more by a deliberate effort, we concentrate our mind upon the meaning of what the tongue says. ...In more technical terms, this means that we are called to advance from the second level to the third: from "prayer of the intellect’ to ‘prayer of the intellect in heart’. ‘Heart’ in this context is to be understood in the Semitic and biblical rather than the modern Western sense, as signifying not just the emotions and affections but the totality of the human person. The heart is the primary organ of our identity, it is our innermost being, ‘the very deepest and truest self, not attained except through sacrifice, through death’. According to Boris Vysheslavtsev, it is ‘the centre not only of consciousness but of the unconscious, not only of the soul but of the spirit, not only of the spirit but of the body, not only of the comprehensible but of the incomprehensible; in one word, it is the absolute centre’. Interpreted in this way, the heart is far more a material organ in the body; the physical heart is an outward symbol of the boundless spiritual potentialities of the human creature, made in the image of God, called to attain his likeness. To accomplish the journey inwards and to attain true prayer, it is required of us to enter into this ‘absolute centre’, that is ,to descend from the intellect into the heart. More exactly, we are called to descend not from but with the intellect. The aim is not just ‘prayer of the heart’ but ‘prayer of the intellect in the heart’, for our varied forms of understanding, including our reason, are a gift from God and are to be used in his service, not rejected. This ‘union of the intellect with the heart’ signifies the reintegration of our fallen and fragmented nature, our restoration to original wholeness. Prayer of the heart is a return to Paradise, a reversal of the Fall, a recovery of the status ante peccatum. This means that it is an eschatological reality, a pledge and anticipation of the Age to Come — something which, in this present age, is never fully and entirely realized. 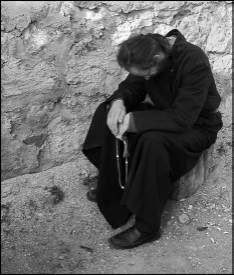 "To say the Jesus Prayer a hundred time attentively and without haste, about half an hour is needed, but some ascetics require even longer. Do not say the prayers hurriedly, one immediately after another. Make a short pause after each prayer, and so help the mind to concentrate. Saying the Prayer without pauses distracts the mind. Breathe with care, gently and slowly.""